The Chunichi Dragons on Oct. 25 secured negotiating rights with Akira Neo, a player from Osaka Toin High School in western Japan, after beating three other teams in a draw during Nippon Professional Baseball (NPB)'s amateur draft. Neo, who has hit 32 home runs during his high school baseball career and has a fastball clocked at up to 150 kilometers per hour (93.2 miles per hour), was one of the draft's most sought-after prospects. Besides the Dragons, Tokyo's Yakult Swallows and Yomiuri Giants, and the Sapporo, Hokkaido-based Nippon Ham Fighters took part in the draw. Also making waves in the draft pool, the Nippon Ham Fighters secured rights to 17-year-old Kosei Yoshida, a fireball pitcher from Kanaashi Nogyo High School in the northern Japan prefecture of Akita who turned heads at the 2018 Koshien national high school baseball tournament. 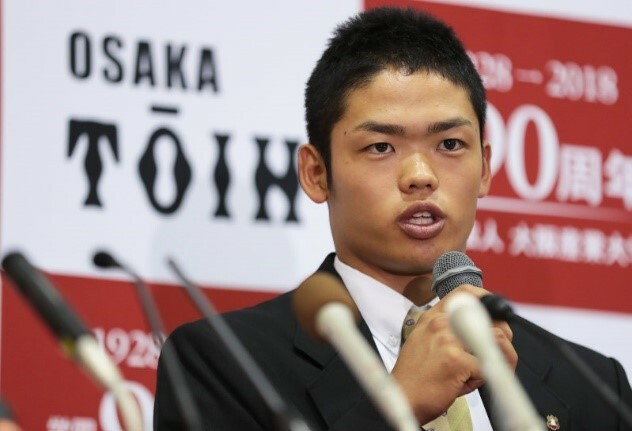 The Hiroshima Carp, meanwhile, beat the DeNA BayStars, SoftBank Hawks and Orix Buffaloes to grab negotiating rights with 18-year-old infielder Kaito Kozono, from Hotoku Gakuen High School in western Japan's Hyogo Prefecture. Neo appeared tense as he watched a televised broadcast of the draft, held in a room packed with about 200 reporters and 24 television cameras. He finally smiled after it was announced Chunichi had won his negotiating rights, saying he was "relieved." In a news conference at his school in Daito, Osaka Prefecture, Neo said he felt a "special connection" with the Dragons, which are based in the central Japan prefecture of Aichi. The prefecture neighbors Gifu Prefecture, where Neo grew up, and in his sixth year of elementary school, Neo was chosen to represent a junior Chunichi team in an NPB tournament for children, wearing a Dragons uniform. Neo excelled academically in junior high school, but he stayed laser-focussed on sports and his goal of playing professional baseball. With the backing of his doctor parents, he entered baseball powerhouse Osaka Toin High School and played both infield and outfield positions. The school put him on its roster for a total of four spring and summer national tournaments at the famed Koshien Stadium in Nishinomiya, Hyogo Prefecture, and he contributed to three wins. Neo says he looks up to Ichiro Suzuki of the Seattle Mariners, for his "playing style and approach to practice," and wants to become "a top professional player." Yoshida, meanwhile, addressed a news conference at Kanaashi Nogyo High School in Akita. When asked for his impression of the Nippon Ham Fighters in Japan's northernmost prefecture, he said, "There are many players on the team who entered as No. 1 draft picks, and I want to perform with them." He said he wanted to be a pitcher representing the world of baseball and compete on the world stage with the Japanese flag on his uniform. Yoshida said he was relieved when his name was called in the draft's second round, in which he was the Nippon Ham Fighters' top pick. When asked for his opinion of Hokkaido, he said, "Compared with Akita, it has a lot of better-quality snow," drawing laughs from the audience. He said he was happy when friends from his school baseball club told him that they could come and watch him play, as Akita is close to Hokkaido. Yoshida, a right-handed hurler whose fastball tops out at 152 kph (94.5 mph), helped his high school become the first from the prefecture in 103 years to make it to the final of the summer Koshien tournament, officially known as the Japanese High School Baseball Championship. However, the team fell to Osaka Toin. "I didn't have the pitch control I wanted at Koshien. I want to step up a level and control my pitches as a professional player," he said.